There are not too many trading platforms that can provide the trader with the necessary tools for futures trading (in comparison with Forex and binary options). NinjaTrader is one of the most popular trading platforms in the post-Soviet space, which gives you the opportunity to earn an income in futures trading, however, the possibility of the classic trade on the FX market is also present here. The free version provides the possibility to trade only in manual mode, while automatic additional settings are required to purchase the full version. The list below will help you to decide if you have enough functionality in the free version. Intelligent Stops — automatic transfer of orders to breakeven. It is easy to notice that the full version of the program (automated trading) can significantly save time for professional trader, eliminating slippage, and fans of the scalping strategy in Forex can not work without automated trading. By the way, the built-in tools (analytical scripts) created in accordance with the latest developments in the field of trading in financial markets, give you the flexibility to customize the visualization of the dynamics of the market to the individual needs of any investor. The manual trading mode is recommended for those who are just starting to learn the basics of trading. Demo version allows you to develop your own trading decisions. 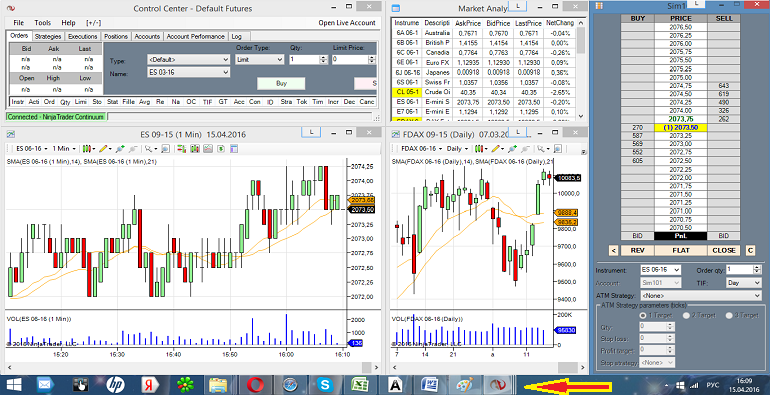 Today the latest version of the trading terminal is — NinjaTrader 8. To sum up. NinjaTrader trading platform is a great terminal in a free version for those who already have experience with currency pairs and now wants to try his hand at futures financial markets. Nice intuitive interface and a minimum of necessary tools, comprehensive support from both developers and more experienced companions — all this speaks of the versatility of the terminal for both the beginner and the professional. And for those who really want to appreciate all advantages of this platform, we recommend you the paid version of the terminal! Great intsihg! That’s the answer we’ve been looking for.